Books, Dogs, and Knitting. Three of my favorite things. 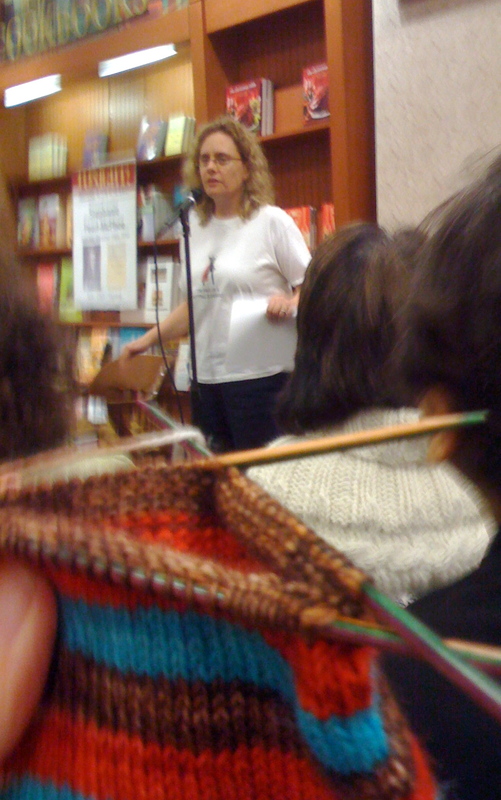 I went to see the Yarn Harlot’s book reading last night at Barnes and Noble with Erin. Sorry, it’s kind of hard to take a one-handed iPhone photo! Twilight, New Moon, Eclipse and Breaking Dawn, all by Stephenie Meyer: I highly recommend these books- I’ve gotten my sister and my mom to read them, and my sister in law just bought the first one the other day. My favorite of all the books is the first, though I didn’t really like the way the series ended. I read all four of these hefty books in the period of about one week- I couldn’t put them down. Two of the Women’s Murder Club Series by James Patterson: 1st to Die, and 2nd Chance. Both of these are about a group of four women who help each other solve horrible murders and help each other with life’s problems. They also happen to be good page-turners to keep you busy on the train. Marley and Me by John Grogan: Joey was browsing a bookstore and picked this one up for me. It was definately cute, but it made me miss Daisy and Henry. Speaking of dogs…. HENRY’S COMING TO LIVE WITH US AGAIN in a little over a week! If you don’t know the story- when we moved to Brooklyn we had to leave the dogs back with my parents in Texas because our landlord wasn’t sure he wanted us to have pets. Well now that we’ve shown him that we’re good tenants he’s allowed us to bring a dog. We’re just bringing up Henry at first cause he’s a little easier to handle: he doesn’t cry or howl when you leave the house and he doesn’t try to bite strangers. Plus I know Daisy is living the life and being spoiled rotten by my parents. Seriously- she and my Dad have bonded and she waits patiently next to him every morning while he eats breakfast and he always saves the last bite for her. Not to insinuate that Henry’s not being spoiled- he definitely is getting the free run of the house and farm. He’s even gone down the road a few times to meet the neighbors (another reason why he’s the one we’re bringing up first.) I can’t wait! suuuper exciiiited about meeting henry! Oh, wow — Henry in the Big Apple! How’s he going to get there? Will he miss Daisy (or vice versa)? Even though the picture of her and your Dad is too wonderful. So jealous you got to meet the Yarn Harlot. Dallas is not so lucky. Socks are looking good. I need to get on mine but I too have been hit by the reading bug. Rylee and Easton sure will miss Henry. We will really miss Henry, he has kept me on my toes…he loves to chase the cows and tries to chase the donkeys..we’ve had to watch it cuz they chase back…and they kick hard. He is such a sweetie. He has the best personality and the neighbors that he has visited will miss him too. I just saw the Meyer books today – I had seen the names but didn’t really know what they were about. I may have to look into them.